The TaylorMade TP Red-White Collection putters are designed with a clean and precise Milled 304 stainless steel head with new high-contrast, Red-White finish to help you envision a proper path and improve alignment. The Pure Roll aluminum insert provides a firm feel for optimal forward roll and the adjustable sole weights allow for head weight personalization. 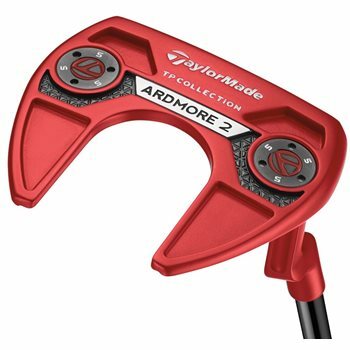 The Ardmore 2 offers a progressive full mallet head, two cavity sightlines and one top sightline, a 27° toe hang and a full shaft offset. Milled 304 stainless steel heads with a new high-contrast, Red-White finish to help golfers envision a proper path and improve their alignment. Steel shaft in an all-black PVD finish. Pure Roll™ insert for optimal forward roll—firm feel with aluminum insert. Adjustable sole weights for head weight personalization.